Times are certainly changing in East Asia. 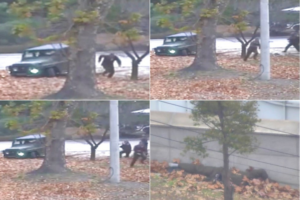 Tensions are rising as North Korea (NorKs) shows increasing belligerence. 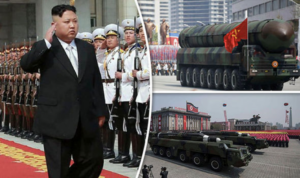 The continuing test-firings of long-range missiles by North Korea has only increased those tensions and the excitement along the DeMiliterized Zone (DMZ) between North and South Korea has become famous on social media. As for a response, Western governments are becoming less and less tolerant of the oppressive regime. Even China has sent signals that they will not back the NorKs in a conflict. Beyond that, there is some important and bad news for N Korea’s dictator Kim Jong Un: Japan is slowly rearming and gaining offensive military capabilities. In a recent snap election held on October 22nd, Prime Minister Shinzo Abe and his political allies retained their 2/3rds majority in the Japanese Diet/Parliament. That election was intended to demonstrate voter confidence in two major policy initiatives: Abenomics, the name given to Abe’s economic policies, and the growing effort to restore Japan’s war powers. Abenomics has been largely successful at driving job creating and stabilizing the Japanese economy. Japan is beset by demographic problems including a low birthrate, too few young workers, and an aging population (those over 65 now make up over 1/4th of the population compared to 1/8th of the US population). Nationalism and prosperity are seen as means of reversing those demographic trends. Abe also has been slowly building up the Japanese Self-Defense Forces (JSDF), has expanded their mission by reinterpreting the Constitution, and has been adding a few offensive weapons and capabilities. 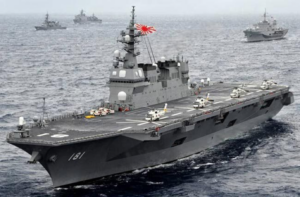 Japan now has a small amphibious battalion which it hopes to expand to brigade size. 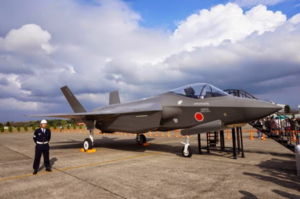 The JSDF has purchased F-35A stealth fighters, mid-air refueling tankers, and long range land to sea missiles that can also strike ground targets. 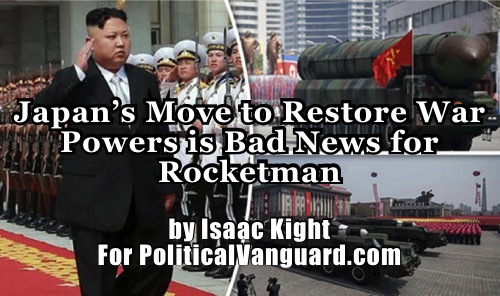 All of this is certainly bad news for Rocketman – the name President Trump has given to Kim Jong Un. When General Douglas MacArthur accepted Japan’s surrender on September 2nd, 1945, he set about changing Japanese society to prevent any future war. MacArthur was more keenly aware than many others that militarism, the Bushido Samarai honour code, and the sense of duty and loyalty to the Emperor ran deep in Japanese society. It would take major changes in the culture to make Japan a truly peaceful nation. The Japanese people, having suffered their first ever major military defeat and the occupation of their home country, felt a deep sense of shame and thus took to these reforms as the necessary, if painful, steps to recovery from the War. As a concession to Japanese tradition and culture, and also after the Emperor’s role in opposing the war and also in bringing it to an end was revealed, the office of the Emperor was retained. Aside from that, the Japanese constitution set forth by the occupation government was very different from any previous governing document in Japan. As a result of this article, Japan is not to have a military force with offensive capabilities, cannot declare war on other nations or join in conflicts with other nations, and has even been remiss about joining United Nations peacekeeping efforts – until recently that is. Abe’s government controversially expanded its interpretation of Article 9 to extend defense to the defense of allies as well as that of Japan itself. That move was certainly made with South Korea in mind, as a friend, and North Korea as a foe. Since that time, Japan has been slowly and carefully building its Self-Defense Forces into a more capable military force with offensive capabilities. Prime Minister Abe, however, aspires to go a step farther. He would like to repeal or rewrite Article 9 itself and restore war powers to the Japanese government. Article 9 has long been a sore point for Japanese conservatives. The long-ruling Liberal Democratic Party (LDP) was founded in the mid-1950’s with a platform of economic recovery and development and also the goal of writing a new constitution for Japan. Article 9 was the primary reason they sought a new governing document. 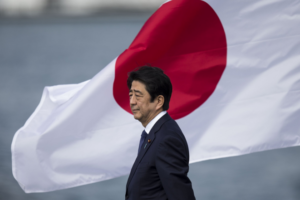 Shinzo Abe seems poised to take that step once and for all. Article 96 of the Japanese Constitution addresses the amendment process. Amendments must be introduced by a 2/3rds majority of both houses of the Japanese Diet; much like the United States Constitution. From there the amendment is put to a national referendum. If a majority of voters approve the amendment, it is ceremonially ratified by the Emperor. Prime Minister Abe originally set a goal of holding such a referendum by 2020, riding the wave of popular support for his government. Abe seemed to walk that back recently. Polls show the Japanese population about evenly divided on the matter with those in support of the reform having a slight lead. Shinzo Abe has seen the results of the Brexit vote in the United Kingdom that brought down Prime Minister David Cameron. Betting your government on a referendum is risky business. It is likely, however, that Japanese voters will have a chance to ring in on the issue sometime before 2021. North Korea is certainly a serious threat to US interests and it would be valuable to have additional support to deter NorK aggression. In the event that Rocketman does start a war, having the assistance of Japanese forces in the region would prove invaluable. For some time American fiscal hawks have been calling for Japan to rebuild its military forces so the US can withdraw some of our forces. Japan’s inability to make war makes the United States responsible for Japan’s security. It could be argued that the time for this arrangement has come and gone. Japan is wealthy enough to look out for its own defense and the US could scale back its presence. The question must be asked, however, as to how Japan will behave as a military power. Most of East Asia remembers what happened the last time Japan was a military power. China is a key factor in this equation. The leadership in Beijing is keenly aware of the Nanjing massacre and has expressed deep concerns over Japan’s remilitarization. China has been challenging US by attempting to assert control over the South China Sea. This has Vietnam and the Philippines concerned for their security. China’s longtime nemesis, Taiwan, is likewise concerned. Given that North Korea is ostensibly an ally of China, S Korea can be included in that lot. India also has a long term adversarial relationship with China. Could Japan become the sixth military partner in a US-led coalition of nations who surround China? The Chinese will certainly raise concerns and may use this as an excuse for further military buildup. Russia is also a major factor: In August of 1945 the Soviet Union invaded Manchuria and conquered the Kuril Islands. The latter are a chain of Islands just north east of Hokkaido, the northern most of the four largest Islands that make up Japan. Might there be a repeat of the 1906 Russo-Japanese War that humiliated Russia? Japan has been adamant that the Kuril Islands be returned to Japan. Russian President Vladimir Putin is unlikely to be willing to restore them peacefully. Overall, Japanese culture has become peaceful if not docile. Gone are the days when massive crowds gathered to celebrate duty to the Emperor. Long gone are the massive armies shouting “Bonzai” to announce their victories throughout Asia. In their place, Japan has become an economic empire built on mutual trust and mutual profit. At a time when just shy of half of Japanese voters do not want to see a reform of Article 9 and want to maintain the nation’s passive military status, we can safely assume Japan will not be a threat to anyone in the near term.